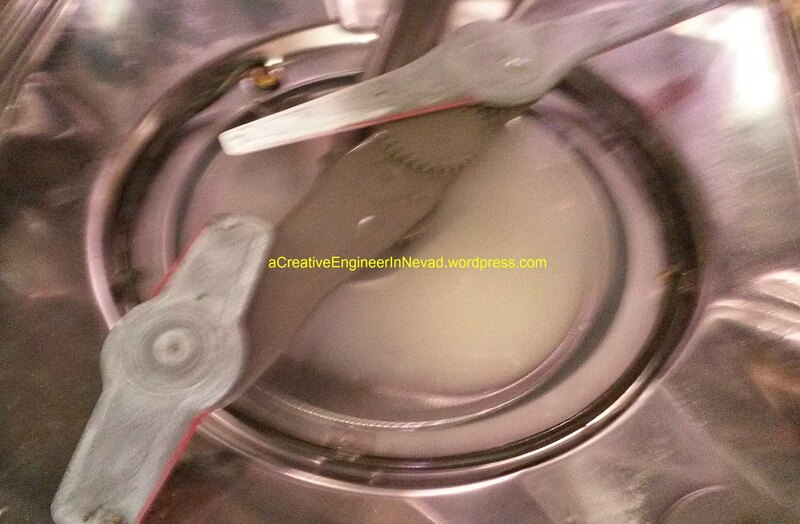 Update: I found out this morning that EveryAppliancePart.wordpress.com blog mentioned my post and linked to it. Here it is if you want to see. Also, I realized I didn’t mention the YouTube video I had found so I added the link. Note: I didn’t watch past the point where it stated what a ‘drain air gap’ was and that I needed to clean it out. So, this morning I was being super productive – listening to the television, making Gluten Free Waffles (which I just realized I haven’t posted the recipe for yet, but I will), cooking bacon in the oven and emptying the dishwasher all at the same time. Sounds pretty good, right? Well, it would have been IF I had checked the bottom of the dishwasher before I emptied it and put the dishes away. Note to self: Check the bottom of the dishwasher before emptying it. See, the dishwasher was filled with dirty water (and the amount in this photo was after I had scooped most of it out) – yuck! So, now I had problems: not working dishwasher, a sink of dirty dishes AND I didn’t know which dishes sitting in the cupboards had just come out of the dishwasher! So, I pulled out the dishwasher booklet and saw a note about cleaning the ‘drain air gap’ – I didn’t even know what that was or where it was. 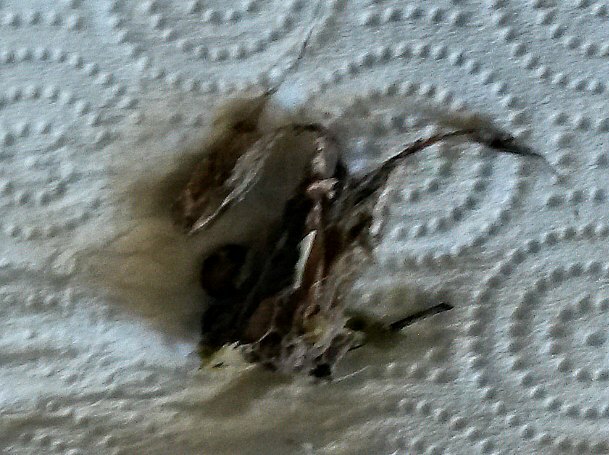 Do you know what it is?? 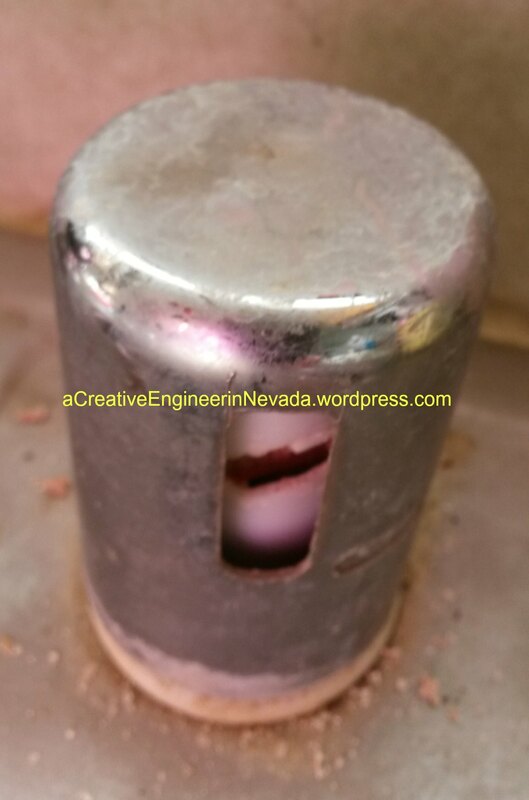 After I cleaned out the ‘drain air gap’ and scooped out all of the dirty water I ran a quick wash and prayed it would not have any dirty water in the bottom when the cycle was finished. I was doing the happy dance when the bottom of the dishwasher was empty when I opened it! So, I have done multiple loads of dishes today – I at least knew the blue dishes had not been used lately so they were skipped. I still have a sink full of dishes, but I am almost back to where I started this morning. So, I am guessing I saved a couple of hundred dollars and a call to the plumber. 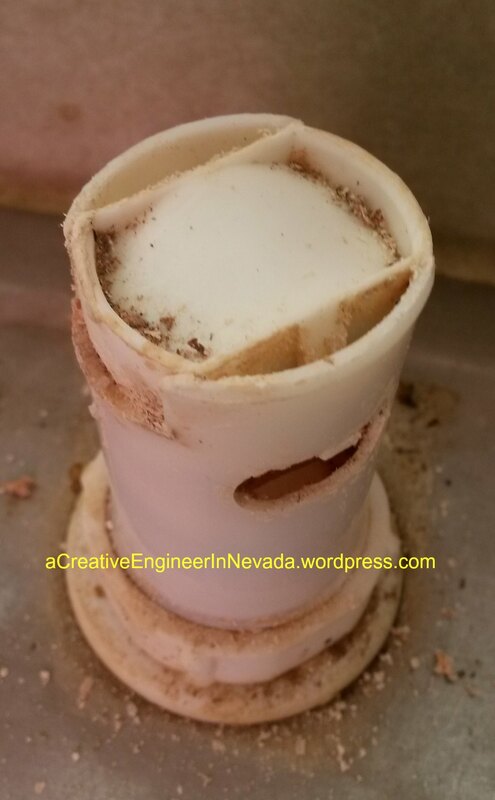 Do you have a Drain Air Gap (sounds like they are not required in all areas)? When was the last time you cleaned it?? I was talking to an extended family member the other day about the Master (shower) bathroom upgrade blog post. and I realized that I didn’t say how much we spent on it. b) Toilet Seat – We had already bought the seat for our old toilet in that bathroom. So, I guess it cost $0.00 for this upgrade. I will use that amount even though the ‘cost’ of the front bathroom flooring was really twice that since we needed one piece from this box to finish that floor (which really makes this bathroom flooring free). I think that was definitely worth it to get a bathroom that saves water, has a new floor and is what we wanted. Since our house is over 20 years old and we are on a well we decided it was time to upgrade the toilet in the Master (shower) bathroom to a low water usage model. While we were at it we decided to remove the carpeting (it still looked good, but I was so happy to see it go). A while ago we decided to paint the lower half of our Master (shower) bathroom walls. 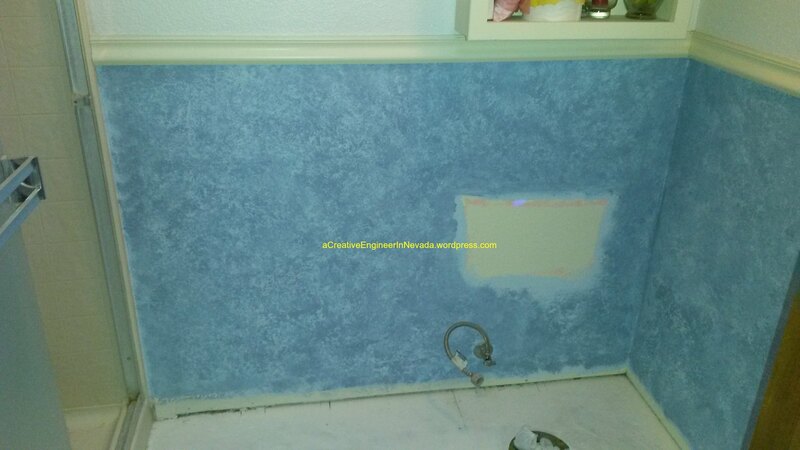 At that time I did a Faux finish – one color of solid blue painted and then a darker color sponged over the top. Knowing that the new toilet had a smaller tank it became obvious that I would have to repaint the wall before the new toilet was installed. So, instead of going to the work of trying to match colors and sponge marks I decided to just paint the walls and bottom molding a solid blue. Here is what we changed and what supplies we used. All items were bought at Home Depot. Note: We paid for all the items and supplies we used for this project. a) Paint (part of a gallon) – Behr, Fragrant Breeze (semi-gloss, pastel base) – This paint was bought a while ago and it was also used above the Kitchen cabinets. b) Toilet – American Standard H2Option Dual Flush (1.0 / 1.6 GPF), round front, Bone color. **The wax ring and toilet seat have to be bought separately. The builder of our house didn’t believe in large bathrooms so we had to buy a round front toilet for each bathroom (and our shower and bathtub are Bone colored so white wouldn’t work either). 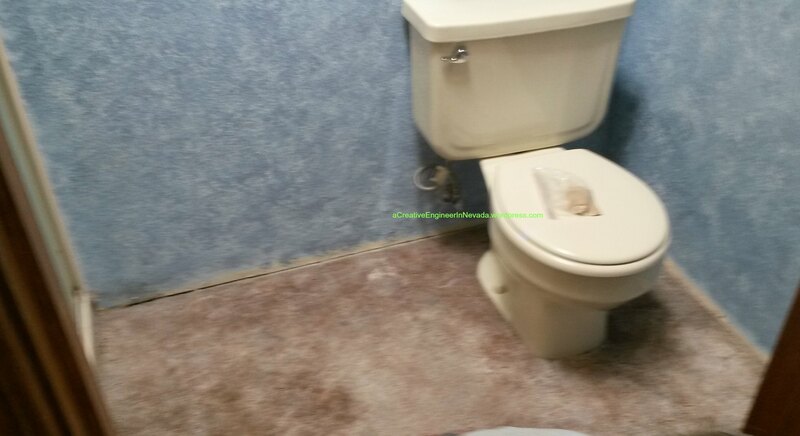 This is the second one of these toilets that we special ordered through Home Depot – the first one was in February 2014 (for the other bathroom) and it works great. 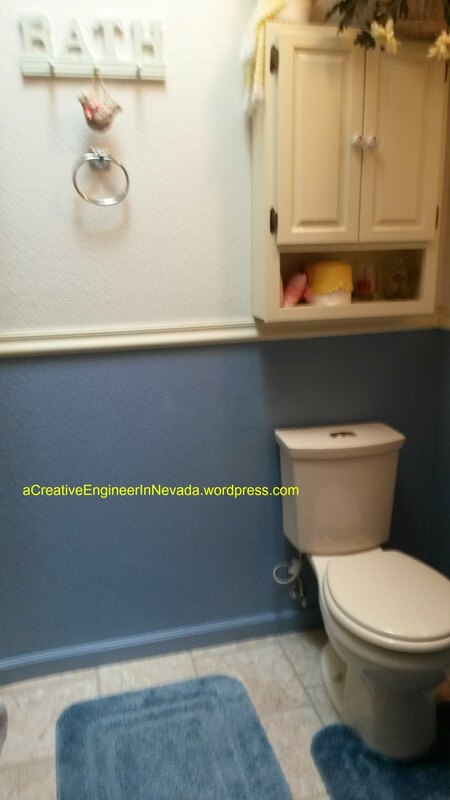 d) I also repainted the bottom molding with the same blue color so they matched the walls. I am happy how it turned out. What home remodel project have you worked on lately? And as a side note, I went through Southwest Rapid Rewards so I will get points for the dollars we spent at Home Depot. As an extra bonus I bought Home Depot gift cards at a local Grocery Store so the cost got me extra reward points there also. Besides that I used our credit card (which gives us a percentage back) to buy the gift cards. I think that was a triple play! 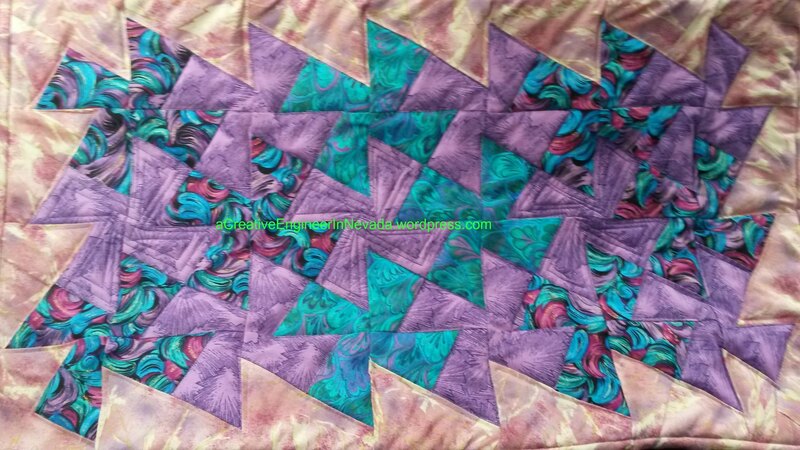 I decided I needed to make something similar for my Scunci mop head. Scunci mop head as a general pattern, leftover piece of terry cloth and a left over scrap of microfleece type material. It worked so great I created a second one and they have got multiple uses already. The first time I tried to cut out the squares I cut into the next row of squares 😦 I put this project on hold until my sister-in-law came to visit. Thanks to Angi for helping me figure out what I was doing wrong. Note to self: Don’t run the rotary cutter all the way to the corners – cut the corners out with scissors. Oh, and since I was wearing a left wrist brace (due to spraining my wrist) at the time, I had to be creative in holding down the template. I ended up using a full can of Chili (about 15 oz) as a weight and then holding the can. The worst problem was my hand was definitely hurting by the time I was done. I think it turned out pretty good. What have you made lately?